Country star Martina McBride kicked off the second leg of her “Love Unleashed” tour Thursday night and St. Louis was the lucky enough to be chosen as the kickoff city. The venue chosen for the kickoff was the Peabody Opera House. The Peabody is a beautiful classic venue located on Market St. behind Scottrade Center and is a rare gem for taking in a concert. The Opera House is exactly what it says it is, a classic opera house, this allows for a very intimate experience while attending a show with some elements of the larger venues such as professional lighting and sound. The overall experience is one I highly recommend. Openers Post Monroe and Maggie Rose started the evening with a very nice acoustic set which consisted of three acoustic guitar players and a “Cajun” style acoustic drum box. Post Monroe bring a good level of energy to the stage when they perform and it is easy to tell that they enjoy what they are doing. The vocals and harmonies one gets to hear from this set is very pleasant as five of the six members sing. It is a very pure sound with the acoustic setting. Maggie Rose adds a very powerful and pleasant vocal style to the stage as well as playing guitar and tambourine for a a successful mixture of talents. The set was highlighted by Post Monroe’s tune “Red Hot American Summer” which is currently being aired on CMT. 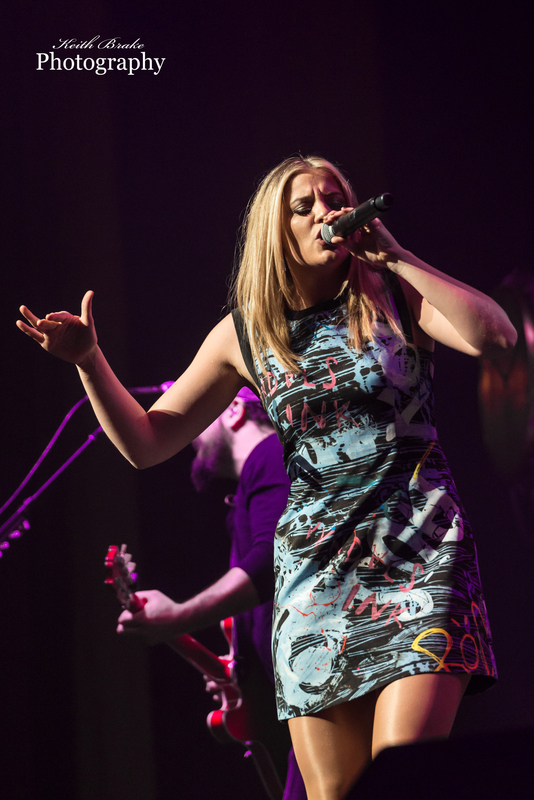 Next to take the stage for the evening was Lauren Alaina. When you go to a concert you want to see a few things, stage presence, energy, connection and appreciation for the crowd. Lauren delivers on all accounts. She brings an upbeat, at moments almost “Poppy”, energy to the stage, an energy that could only come from someone who is having a blast while performing. Just how does she connect with her fans? How about bringing a lucky fan on stage with her? Lucky that is until he realized he had to dance for the whole crowd, but he was a trooper and it was a good laugh for all. During her introduction of her song “3”, Lauren noticed a young fan in the crowd wearing one of her shirts, this brought her to tears as “3” is a very emotional song about moments lost due to touring while trying to “make it”. She dedicated the song to the young lady wearing her shirt and delivered an inspired and beautiful performance of it. Lauren’s set was highlighted with her performance of her single “Road Less Traveled” which was sitting at number thirteen on the charts the evening of the show. When Martina McBride took the stage the crowd was primed and ready for her performance, and she did NOT disappoint. The set started with a short video explaining the reason and meaning behind the “Love Unleashed” tour. “Too many bad things in the world” she said, “I wanted to focus on the good things in life like family and love”. Therefore, the setlist was comprised of songs about those two things. Every note was powerful and crystal clear. Every note sung with the same conviction to her audience that she has for the last twenty five years. Some artists are transcendent in the fact that they can deliver album quality vocal performances live and Martina is one of those artists, hitting every note from start to finish with perfection. The band that travels with Martina is no less talented, every note on time and every harmony perfectly in its place. She called them “her chosen family” and they must feel the same about her as it shows in the quality of the performance. Songs from the past as well as new material from the album Reckless were enjoyed by those in attendance. Throughout her performance the St. Louis crowd treated Martina to some standing ovations and extended applause, she was touched by this and commented upon how she knew St. Louis was the proper location to kick off the second leg of the tour because “Missouri has some real country music fans”. Martina also talked about her roots in country music and how she got started in the industry. Her father introduced her to music by playing in a band himself. Be sure to check out the photo gallery of the show after the setlist. Very detailed and Awesome review. Thanks Mike, glad you enjoyed the read. Keith, you definitely captured her beauty, & I can almost hear her. Great work, your photos are so amazing. Great review !! !… Compliments for the photos….Awesome !!! Thanks Franke, glad you liked it!